Last year on Christmas Day, Chelsea were struggling at 4th place with 34 points in the Premier League. They had conceded as many as 18 goals from the 17 matches they had played of which they lost three. One of the losses was to League minions, Stoke City. Around that time a 6'4" 25-year old Serbian midfielder was making a name for himself in Portugal and was just a month away from signing with the Blues. Fast-forward to Christmas 2014. Chelsea are at the top with 42 points from 17 matches, conceded just 13 goals and lost just one match. This time around the Blues did not stumble against Stoke City; they won 2-0. The only match they lost was in which a 26-year old Serb did not play. That's the kind of difference Nemanja Matic has brought to the club he was signed into 10 months ago. Interesting is the fact that he was with Chelsea in 2009. But being plagued by injuries and poor form meant that he spent most of the season on benches. In 2010 he was shunted off to the Dutch club, Vitesse, on a one-year loan. 2011 saw him move to Portugal where he joined Benfica. That was where his talents as a mid-fielder begun to show. So much so that he emerged the Primeira Liga Player of the year 2013. Meanwhile, Jose Mourinho was on the hunt for an aggressive player to fill in a defensive midfield role for Chelsea. His search led him to Benfica and Matic, who possessed qualities suited to English football - control of the ball, great physical strength and a goal threat to opponents. Quite a few eyebrows were raised when Mourinho got in Matic for £21 million, in which Chelsea coffers took a £18 million hit in losses resulting from the £3million David Luiz swap-deal. But how the move has paid off for the Blues! 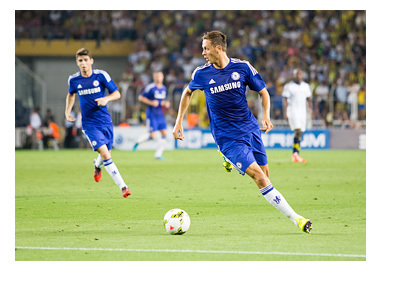 Matic is Mourinho's monster in the midfield. Whether it was tackling the likes of Yaya Toure, Jack Wilshere and wrest control of the ball or keeping up to Danny Welbeck's frenetic wing-runs, Matic was the man. In a match against Arsenal he covered an incredible 6.09 kilometers in the first 45 minutes, more than any player on either side. Costa, Hazard and Fabregas may have hogged the limelight for Chelsea this season, especially Diego Costa with his prolific scoring, but the real foundation for this success was laid in the midfield by the reliable Serb. Graeme Souness, former Liverpool manager and Scottish international, was one of the many to be impressed by Matic and said that the Serb never wasted time over antics with the ball or try to score a goal anyhow, but made sure that all threats were closed shut when the opposition possessed the ball. John Terry who has been a first-hand witness to the big Serb's progress felt Matic is a complete player and possessed the necessary speed to break-up the opposition's midfield game and display great dribbling skills at the same time. In the 2-0 revenge victory over Stoke City last week, Matic's midfield abilities just peaked; it was sheer quality and resilience. He held the middle of the pitch for the Blues. He completed 88% of his passes apart from 6 tackles, 6 clearances, 4 blocks, 2 successful headed duels and 2 interceptions to his credit. Earlier in November, he covered an astonishing 12.4 kilometers in Chelsea's 2-1 win over Liverpool, demolishing just any rival move that came his way and winning as many as 5 tackles. So impressed was Mourinho with Matic's play in the match, that he chose the Serb to deliver the team-talk at Anfield. That shows the kind of regard the manager holds for his prized playmaker. Before Matic's arrival, of the 10 matches the club played, there were just 4 wins, 3 draws and 3 losses. The win-ratio was a meagre 40%. Post his arrival, of the 40 games in which the Blues figured, there were 29 wins, 7 draws and just 4 losses. This translates to a very impressive win-ratio of 73%. These figures speak out loud of his immense significance to Chelsea and clearly underlining his contribution in transforming them into the most complete side in England. Mourinho's monster could very well hold the key for greater glories to come for the Blues, both at home and Europe, in 2015.